The NFU has warned Chancellor Philip Hammond that the recent UK applied tariff policy announcement is another example of how British farming will be damaged by a no-deal Brexit. In a letter to Mr Hammond, the NFU reaffirmed its position of being absolutely committed to avoiding a disorderly exit from the EU. Ms Batters said that under the no-deal tariff policy even those sectors that are treated sensitively by the government will, in most instances, see worrying and large reductions in the tariff rates currently charged on non-EU imports. “Tariffs currently in place by virtue of EU membership on almost all agricultural products deemed to be sensitive by the UK will be slashed, including those on beef, poultry meat, cheddar, butter, sugar and pork,” she said. Ms Batters said that the NFU is keen to work with government to have a better understanding of the economic modelling, assumptions and potential trade-offs that have been used in arriving at this point. The underlying point, the NFU said, is that a no-deal exit from the EU would be disastrous for British farming and food production and should be avoided at all costs. The NPA is backing the unions in their call. 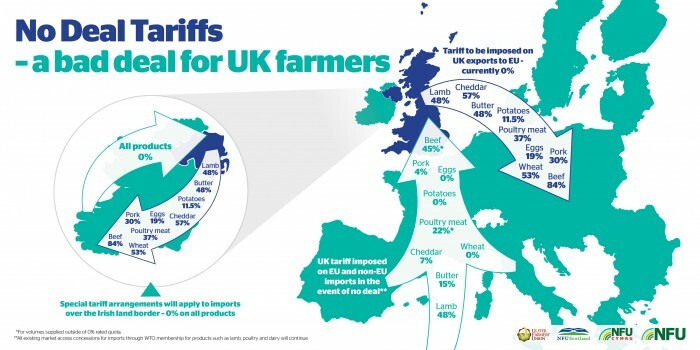 NPA senior policy advisor Ed Barker said: “While we welcome the fact that the tariff proposals include some protection for pork, we share the farming unions’ concerns about the low rates proposed. “We understand that the Government is seeking to is seeking to prevent major food price rises, but the proposed regime would significantly reduce barriers to non-EU imports and open up the UK to the threat of imports produced to lower production standards than permitted here. That is something we are desperately keen to avoid and we reiterate the farming unions’ calls for the Government to review its tariff proposals with this at the forefront of its mind.